Colonel Sean Fisher has been a U.S. Army Soldier for over 28 years. Colonel Fisher began his military service by enlisting in the Alabama Army National Guard in 1989 as a Military Policeman. He received his commission as an Armor Officer from Auburn University in 1993. He is a graduate of the Armor Officer Basic and Advanced Courses, Combined Arms Services and Staff School, Command and General Staff College, and the U.S. Army War College. Prior to his arrival at Fort Wainwright, Colonel Fisher served as the Director of the Resolute Support Combined Joint Operations Center in Kabul, Afghanistan. Previous non-command assignments include service as an Armor Platoon Leader and Armor Company Executive Officer, in the 24th and 3rd Infantry Divisions; Assistant Armor Battalion S3 in the 4th Infantry Division; Armor Captain’s Career Course Small Group Instructor and Team Chief; Executive Officer to the Chief of Staff, V Corps and Multinational Corps-Iraq; Operations and Executive Officer, 1st Battalion, 4th Infantry Regiment; Deputy Task Force Observer Controller Trainer (OCT), Joint Multinational Readiness Center (JMRC); Professor of Joint Military Operations at the Naval War College, Commanding General’s Initiatives Group Chief, U.S. Army Europe, and Senior Cavalry Squadron OCT for the JMRC Grizzly Team. Colonel Fisher’s previous command assignments include A Company, 3rd Battalion, 66th Armor Regiment, 4th Infantry Division, Fort Hood, Texas; A Troop, 1st Squadron, 16th Cavalry Regiment, Fort Knox, Kentucky and 4th Battalion, 70th Armor Regiment, Baumholder, Germany. Colonel Fisher’s operational and combat deployments include Operations DESERT SHIELD/STORM, INTRINSIC ACTION, VIGILANT WARRIOR, ENDURING FREEDOM, IRAQI FREEDOM, and FREEDOM’S SENTINEL. 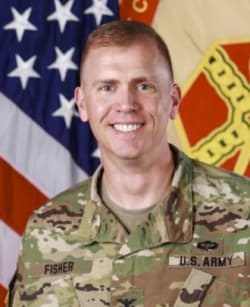 Colonel Fisher holds a Bachelor’s Degree in Criminal Justice from Auburn University, a Master’s Degree in Political Science from American Military University, and a Master’s in Strategic Studies from the U.S. Army War College. Colonel Fisher’s awards and decorations include The Legion of Merit, Bronze Star Medal, Defense Meritorious Service Medal, Meritorious Service Medal, Army Commendation Medal, Army Achievement Medal, Military Outstanding Volunteer Service Medal, National Defense Service Medal, Iraqi Campaign Medal, Afghanistan Campaign Medal, NATO Medal, Southwest Asia Service Medal, Saudi Arabian Kuwait Liberation Medal, Kuwait Liberation Medal, and the Parachutist Badge.